In our first installment of Refinishing My Les Paul BFG, I mentioned looking for a luthier skilled in refinishing guitars in nitrocellulose. 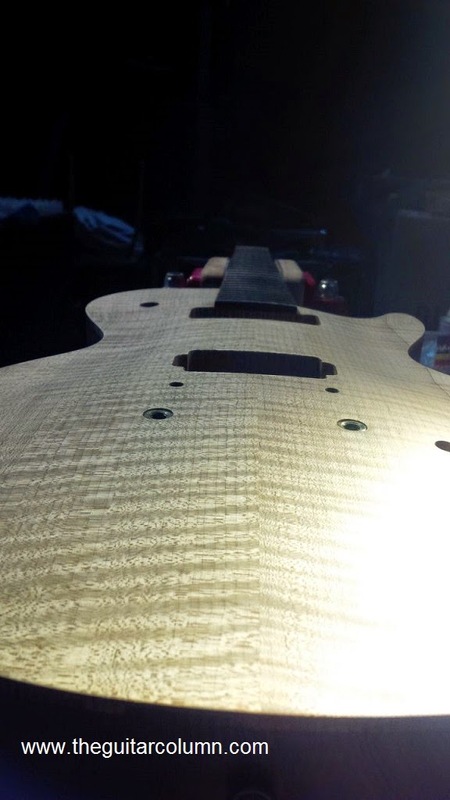 Nitrocellulose lacquer is used on higher-end instruments. It not only looks good but also allows the wood to breathe, resonate and age naturally. But it is also a highly toxic substance that is actually banned in certain states in the US, as well as in some countries in Europe. If you're planning on using this stuff, a good respirator is a necessity. My good buddy Sherman had been raving about the skills of an Italian luthier based here in Singapore and he had been sending me pictures of his repair and restoration work. 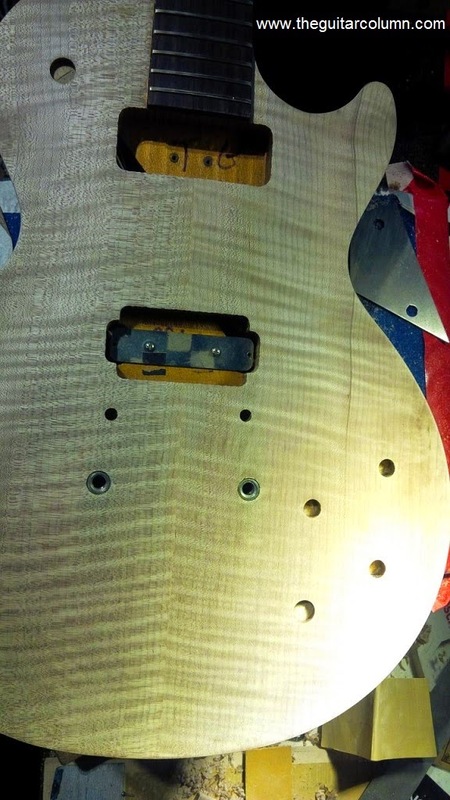 Some of the repair pics were quite graphic -- cracked bodies and snapped off headstocks expertly glued back together and then refinished so that little evidence of the repair remained. And the man behind these extraordinary repairs? Luca Quacquarella. As I was to learn later, Luca had gone to luthiery school in Italy where he had studied classical instrument building and repair -- violins, cellos, double basses and the like -- and was later employed for several years by a prominent custom instrument builder. Sherman and I visited Luca's workshop about a month ago, guitar cases in hand -- me with my BFG and him with his Gibson R8 Les Paul which he had brought along for some minor touchups. Meeting Luca for the first time, I was struck by his obvious passion for guitars and musical instruments. A very genial guy, he eagerly showed us around his shop. And being the know-it-alls that myself and Sherman are, he also patiently listened to us blabber about wood grain, hide glue and boutique pickup winders. Luca showed us his works in progress: a crushed antique violin that someone had sat on, a sunburst 1964 Gibson ES175 in need of complete restoration and refinish, and a Gretsch Duo-Jet that was about to receive a not-so-subtle champagne pink sparkle finish. I knew there and then that I had found the guy who could do justice to my Les Paul BFG. I explained to him what I wanted -- to have the BFG's top sanded down smooth and refinished in nitrocellulose lacquer. Luca explained to me that he could sand the top smooth without a problem but also that he would be taking a fair amount of wood off the guitar in the process. Without any prompting, he also noticed the flame figure in the top of the guitar where my picking had worn through the finish. Things were looking promising! Because of his huge backlog of repairs, it took him a couple of weeks before he could get to my guitar, with the first major task being to sand the top absolutely smooth. The sanding had to be done by hand as a sanding machine would have left flat spots in the arched top. And the pictures he sent me of the sanded down, bare wood top nearly made me fall out of my chair! Go ahead and click on the pics for a closer look! 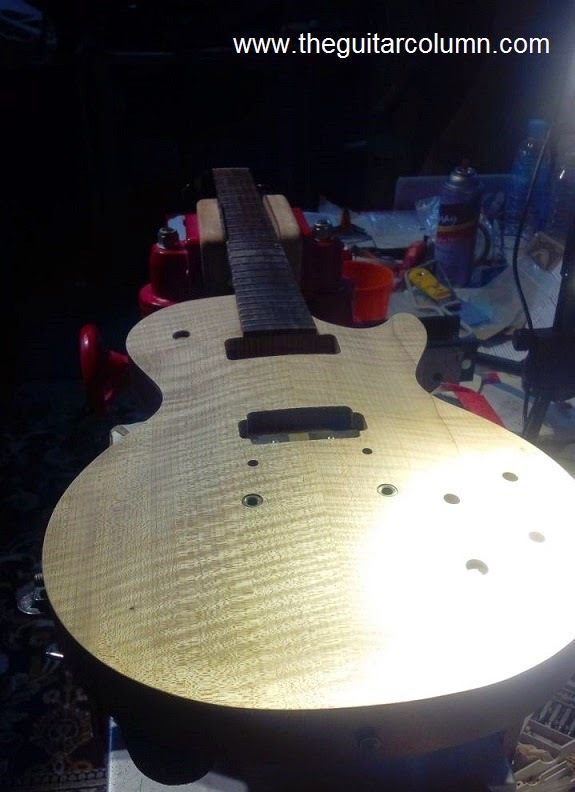 If you read Part 1 of Refinishing My Les Paul BFG, I mentioned that I was betting (and hoping) that there would be a flame top under the paint work. My more rational side however, reasoned that Gibson would never hide a beautiful figured maple top under an opaque finish. Well, this was one time when I didn't want to question Gibson's reason or logic. 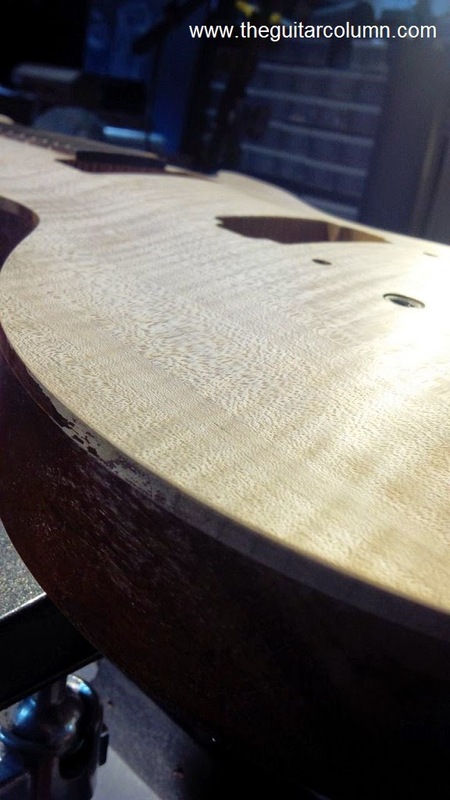 Lo and behold, in all its bookmatched glory, was a beautiful natural flame top. Not too exaggerated as to be garish looking, but not too subtle as to go unnoticed. And I really got a kick out of that chevron bookmatch. To the woodshop guy at Gibson, who deigned this nice maple top fit to be hidden under the crappy paint job of a Barely Finished Guitar, I thank you! Luca gave me time to think about the color of the finish that I wanted on the guitar and told me to send him pictures of guitars in that color once I had made up my mind. I could tell by the look on his face that he had had one too many instances of customers changing their minds. And with transparent finishes, once the base color is applied, it becomes awfully difficult to remove. We're talking about sanding everything down to the bare wood and starting over. I suggested to Luca that he should charge the customer for each change, based on labor and time spent each time. I was kind of surprised that he hadn't even considered it. My initial thought was to go with a natural finish similar to Tom Scholz's Les Paul, which happened to have a similar pickup configuration as the BFG, with a P90 in the neck and humbucker in the bridge. Luca said it would be easy to do, but I could tell that he would enjoy this project more if I gave him a challenge. I really liked the transparent vermillion used on Gibson's newest incarnation of the Slash signature model. Vermillion, I knew, wasn't going to be an easy color to match -- it could go either too red, or too orange. It was like walking a tightrope, as far getting the perfect balance. And Luca's response once I sent him the pictures? "The color is nice. I will try."